Ceo Andhra Form 6 New Voter Enrollment Online Registration and Form 8 Voter Card Correction – Ceo Andhra Voter Card Application Status check at ceoandhra.nic.in…. CEO Andhra basically stands for Chief Electoral Officer Andhra Pradesh (A.P). The CEO Andhra website is a site that works under the control and total supervision of the Electoral Commission of India, a body that administers all the election processes in India. With a goal of effectively serving the citizens of India, CEO Andhra is solely responsible for monitoring any work that is related to the handling of By- Elections and General Elections to the people’s House from Andhra Pradesh, A.P Legislative Council and A.P Legislative Assembly. They do this through preparing and updating Electoral Rolls, re-organizing polling stations, conducting voter education and giving Photo Identity Cards to the electors. Furthermore, CEO Andhra is responsible for successfully implementing the Model Code of Conduct, all Election Laws and any directive given to them by the Electoral Commission of India. This website is fully operational 24 hours a week and can be easily accessed by a voter at any particular time that they wish. With an internet connection and device, access the CEO Andhra Website using http://ceoandhra.nic.in/ as the link. Once in the website, put the cursor on the E-Registration tab, which will then show you two options i.e. Assembly Constituency and Council Constituency. Place the cursor on the Assembly Constituency tab and click on Form-6 that is specifically set aside for new voters. Fill in all the requirements such as state and district. You should also remember to upload your photograph, address proof and age proof. Once you have filled all the required details, click on submit to complete the application process. Access the CEO Andhra Website using http://ceoandhra.nic.in/ as the link. Place the cursor on the E-Registration tab that will then show you two options to choose from namely; Assembly Constituency and Council Constituency. Choose the Assembly Constituency option that will then show you a variety of tabs to choose from. Click on “Form-8” that is meant for correcting the voters card. After click on ‘Form-8’ a new window will automatically be opened. Correctly fill in the required details and click on submit to complete of correction your voter card. Access the CEO Andhra Main Website using http://ceoandhra.nic.in/ as the link. Place the mouse cursor on the E-Registration tab that will then display two options that is Assembly Constituency and Council Constituency. Once again, place the cursor on the assembly cursor and click on the “Know your Status” tab. You will be automatically being directed to a different page from where you can continue the process of checking the status. Select the form that you want to check the status by clicking on the option. In this case, you shall click on “Form-6” option. Once selected, click on the “Search” tab and wait for it to load. You will then be able to check the status of your New Voter Card. How to Check Ceo Andhra Pradesh AP Voters List in ceoandhra.nic.in? Using http://ceoandhra.nic.in/ as the link, access the CEO Andhra Website. Place the mouse cursor on the PDF Electoral Rolls tab which will then show you three options to choose from i.e. Assembly Constituency, council constituency and local authorities. Click on the “Local Authorities” tab that will redirect you to a different page on the site. Select the specific district whose voters list you want from the options that are available. Click on “Get Polling Stations’’ to view the voters list. The voters list can only be accessed using an Acrobat Reader that can be easily installed in your computer. This because the voters list is only available in PDF format that is readable with the help of an Acrobat Reader. Using ceoandhra .nic. in as the link, access the CEO Andhra Website. Place the mouse cursor on the PDF Electoral Rolls tab which will then show you three options to choose from. Click on the “Assembly Constituency” tab that will automatically redirect you to a different page. Select the district and Assembly Constituency whose voters list you want to check. Click on the “Get Polling Stations” which allow you the chance to check the polling station wise voters list. Since the electoral rolls are only available in PDF format, it is recommended that you install Acrobat Reader in your computer so that you can be able to view the list. Election Commission of India Launched a portal for New Voter Identity Card Online Registration to get at eci-citizenservices.nic.in and National Voters Service Portal nvsp.in…..
Functioning under the overall control of the Election Commission of India the Chief Electoral Officer’s responsibility is to supervise and peaceful conduction of general elections and bye-elections which consist both houses Legislative assembly and Legislative council. And also the Election Commission of India again launched a new website for National Voters Service i.e www.nvsp.in. Also follows the instructions and guidelines given by the Election Commission of India. After entering into the eci-citizenservices.nic.in click on National Voter’s Service Portal. It is redirected to www.nvsp.in then again click on apply for new voter enrollment registration. An application will be displayed on screen. Then fill the application as per guidelines. Finally you can upload you photo then click on submit button. There are different forms available at people service from registration to changes in their voter cards. They are given below as a list for your reference from www.nvsp.in. 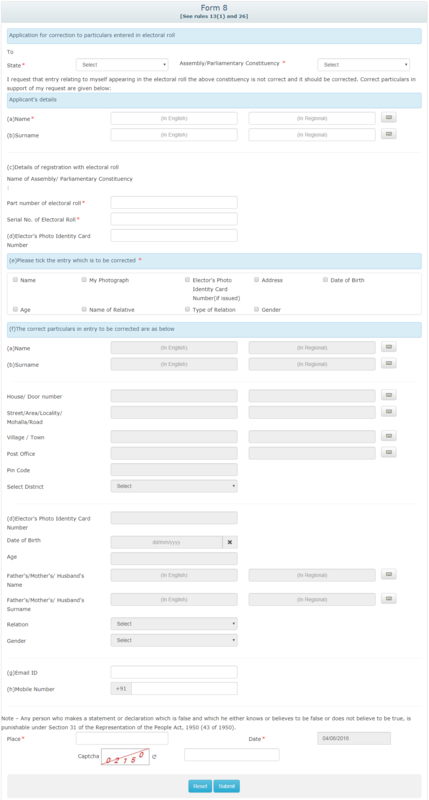 Form 6: English Telugu Bilingual Application for inclusion of name in assembly constituency electoral roll (if your name is not included in the existing roll). Form6A: Application for inclusion of name in assembly constituency electoral roll by an Overseas Elector. Form 7: Application for objection to inclusion of name in any electoral roll. Form 8: Application for objection to particulars entered in any electoral roll. Form 8A: Application for transposition of entry in any electoral roll. Form17: Application for inclusion of name in the electoral roll of a Local Authorities Constituency of the APLC. Form18: Claim for inclusion of name in the electoral roll of a Graduates Constituency of the APLC. Form19: Claim for inclusion of name in the electoral roll of a Teachers Constituency of the APLC. Citizens who are not get the voter id just go to the CEO official website just click Form 6 application form. Fill the application form as per guidelines and submit it. An application id will be given by the Database just note down it. Few days after once check your voter application status at ceouttarpradesh.nic.in web page. If it is approved you can take a print out in your nearest mee seva center. It is very simple process to search the UP Name Wise Voters List, Uttar Pradesh Rural wise Voter List and UP urban wise voter list at sec.up.nic.in web portal. Here we will give simple steps for how to search it. Few options will be drop down. In the drop down list Select and click on “Voter list”. After you can select Urban / Rural. Select Body Type, Name of District, ULB Name and Ward Name. Automatically it can reload and see the search results of voter list. SEC stands for State Election Commission. After completion of the Assembly Elections the Uttar Pradesh Assembly Election Results or UP Assembly Election Results will be announce after few days. We will update as soon. The UP Election Result District Wise and Town Wise will be available at ceouttarpradesh.nic.in and http://sec.up.nic.in/ web pages.